Audi’s R8 LMS dominated a strong field of competition at the 63rd running of the 24 hours of Spa in Belgium this weekend, leading the race, amazingly, for 22 hours. 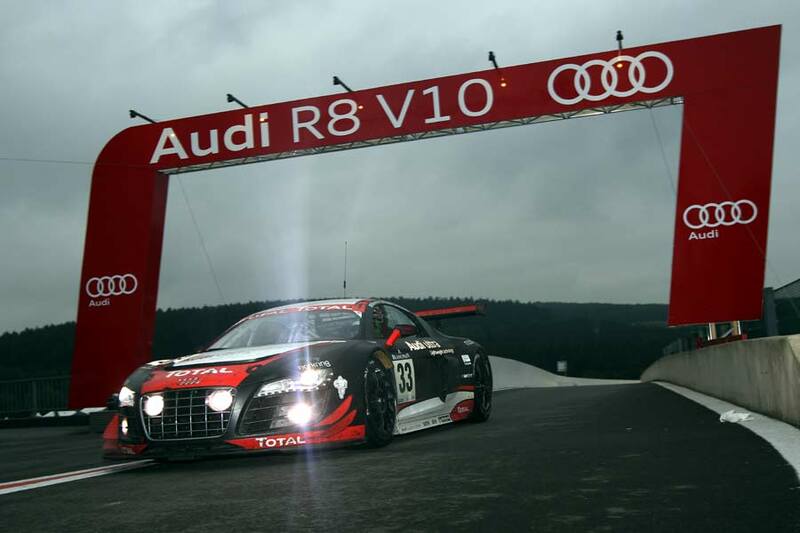 Piloted by endurance racer Greg Franchi, and Audi’s DTM regulars – Mattias Ekström and Timo Scheider – the #33 R8 from the factory-supported Team WRT inherited the lead from Team Phoenix after driver Christopher Haase slid off the track in car #99, leading to the car’s retirement. Impressively, the victorious R8 ended the marathon race two-laps ahead of the Team Schubert BMW Z4 GT3 driven by Dirk Werner, Claudia Hurtgen and Edward Sandstrom. Third place was secured by the Black Falcon Mercedes-Benz SLS AMG GT3 of Thomas Jager, Stephane Lemeret and Kenneth Heyer. “Wow, what a race! To start I thought that I was in the DTM because everybody was driving so wildly. Then there were several incidents involving the competition and sister cars, but we kept out of trouble and just concentrated on fast, clean a faultless driving,” said Mattias Ekström. McLaren Mercedes driver, Jenson Button, marked his 200th Grand Prix in style with a win in Hungary today. Button’s team-mate, Lewis Hamilton, had been leading after passing polesitter Sebastian Vettel in the slippery conditions, early in the race, but it wasn’t to be his day. 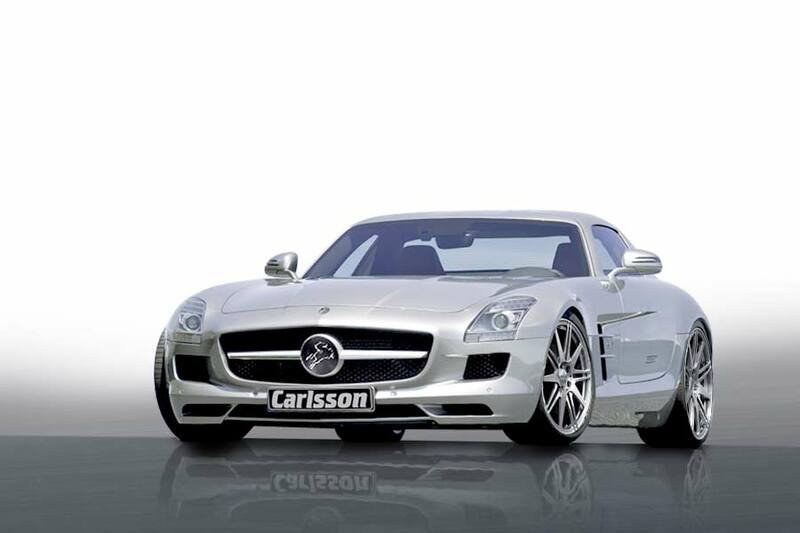 Merzig-based Mercedes-Benz tuning specialist, Carlsson, is offering a range of modifications for the SLS AMG Coupé and Roadster models. Firstly, the Carlsson Tronic lift kit, designed to work in conjunction with the company’s adjustable coilover suspension, allows the driver raise their car by 40 mm – at the flick of a switch, avoiding potential damage to expensive bumpers and undersides on rough roads and speed bumps. A nice touch is the fact that the suspension is linked to the car’s data line, meaning that it can detect the car’s speed, and if it travels above 80 km/h will automatically drop the car back down to its original ride height. The complete set is priced at € 9,980. Those lightweight 1/10 UL alloy wheels are available in 20 and 21-inch diameter from € 9,600. Inside the cabin, the SLS is treated to Nappa leather with owners able to specify such details as piping and stitching colour, special embroidery and punches etc. Prices start at € 4,284 for a simple seat and headrest re-trim, but if your budget stretches a little further, you can also have your dashboard, centre console, armrest, door panels and handles coated – for a total of € 11,519. Other materials on offer include Alcantara, carbon and wood.